and the O’s game against the Rangers, is supposed to be in the mid-80’s!!!! Jose didn’t play in the Blue Jays game against the Rangers. Ryan went 2-for-3, with a two-run homer (4), 2 RBIs (10, 11), 2 walks and 2 runs scored. He raised his average to .327 and extended his streak to 164 errorless games. Craig saw no action yesterday because the Twins had an off day. John saw no action yesterday because the Pirates had an off day. Gabe pinch ran for Pat Burrell in the ninth inning of the Rays game against the Mariners, but didn’t score. Ian went 0-for-4, with two strike-outs in the Rangers game against the Blue Jays. His batting average fell to .381. This is the second straight game in which he was hitless and also struck out twice! I bet we don’t see that happen again all year. Jason didn’t start yesterday because the Rockies had an off day. Scott didn’t pitch because the Diamondbacks had an off day. Youk didn’t see any action because the Red Sox had an off day. The Sawx host the Evil Empire this weekend. Oh Ian! I hope he starts playing better! 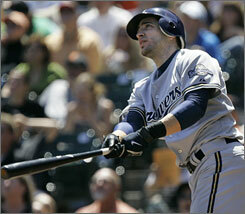 OK, I really wish Ryan Braun would stop having big games against the Phillies! Thankfully that series is done.